My Corporate Hosting Solutions, LLC | Corporate Solutions at Small Business Prices! For further information about our products and services please select from our product offerings below. Does your morning coffee cost you more than your web hosting plan? Don't be fooled by ultra low cost hosting companies. MyCHS provides secure, reliable, and affordable hosting packages for any-sized business. Looking for something more robust than Small Business mail hosting? 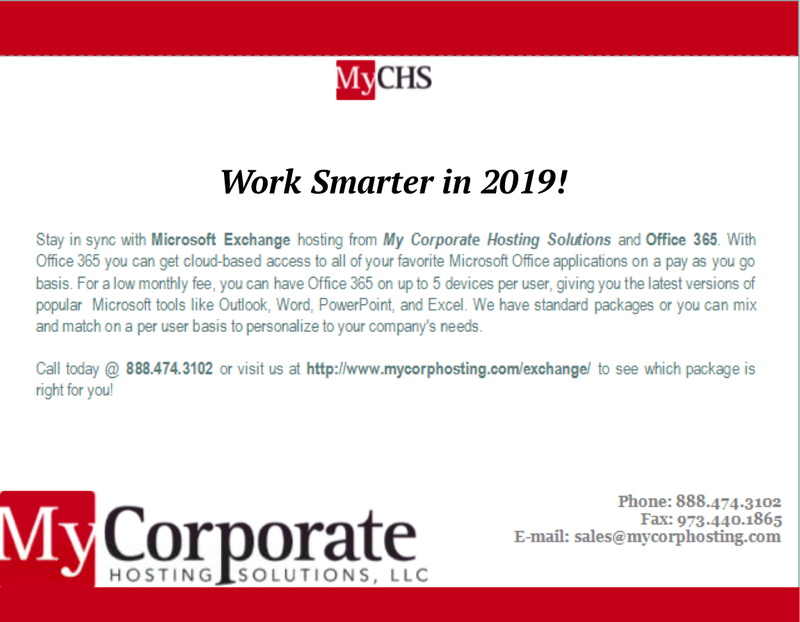 Ask us about Microsoft Exchange Hosting. MyCHS has a number of packages available with add-ons such as Sharepoint, Office Bundling, and Lync. Are you communicating with customers using a free email account? Domain email hosting is surprisingly affordable. Small Business mail hosting from MyCHS will give your company that professional image at a price you can afford. Are you looking to make changes to your website but are in between web developers? At MyCHS we realize that not all customers are looking for a complete redesign. MyCHS offers a number development options to meet your budget and goals. MyCHS has an array of one click web applications to add value to your website. WordPress, Joomla, and DotNetNuke are just a few of the applications that can be installed with no programming expertise. Keep your email network protected, your employees safe, and your business in compliance with easy and effective services from MyCHS powered by Appriver SaaS Email and Web Security solutions. Copyright © 2018 My Corporate Hosting Solutions, LLC. All rights reserved.